“The Ten Commandments of R&B Drumming” (Zoro). At the tender age of three, this Trinidadian born musician was already hitting the back of his mom’s chair drumming beats. By the age of six, he was touring the Caribbean islands with “The Bonaparte Brothers” led by his father Belgrave Bonaparte , a pan pioneer and founding member of the Trinidad All-Steel Percussion Orchestra (TASPO) of Trinidad and Tobago. When he was 13, Bonny began performing with The Trinidad Troubadours, an island band led by Guyana’s renowned vocalist Tony Ricardo. In 1977, at the age of 15, Bonny recorded his first album with the Trinidad Troubadours and his recorded music history begins. 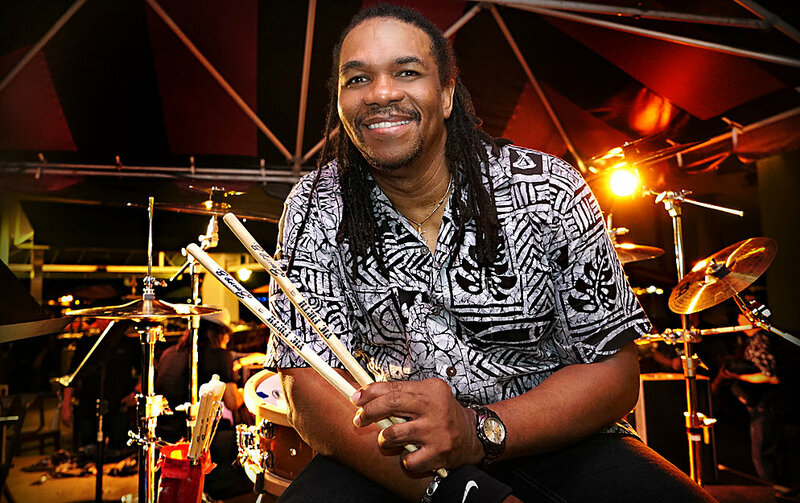 Today, with that tenacious drumming spirit, Bonny carries his passion to stages worldwide performing with legendary artists in many genres. His love, passion and expertise in his music shines in every performance.